Halbrendt Vineyard and Winery is a small-scale winery in the heart of the Adams County countryside that truly gives visitors a vine to wine experience. Visitors will not only get to see the working vineyard where the grapes for the wine they are drinking came from, but get to see the whole winemaking operation right from the tasting room. When it’s ready, it’s ready. That’s John and Noemi Halbrendt’s philosophy when it comes to making their wine. Halbrendt Vineyard and Winery is a small-scale winery in the heart of Adams County. Visitors take a scenic drive up the hill to the tasting room, through the vineyards that produce the grapes going into the wine they are about to drink. John and Noemi Halbrendt, former plant pathologists employed at the Penn State Fruit Research and Extension Center, started growing wine grapes in 2001 for fun and selling them to local wineries. In the next natural step, John decided to try his hand at winemaking. “I became a hobby winemaker and you know, some of the wine I made was pretty decent … My friends said that it was pretty good, so I entered a couple of contests and got a few medals,” he said. For the next 10 years, John would continue making small batches of wine. It wasn’t until he visited a few small wineries that were stationed out of garages or basements that he thought this might be something he could do commercially. Once he retired and converted his own garage into a proper room to produce wine in, the Halbrendt’s officially opened their winery. With a newly opened winery, John quickly had to learn how to maneuver the business side of wine. Being in the heart of Adams County wine country, he had to figure out how to get visitors into their tasting room. “We aren’t far from Gettysburg, but we are a little off the beaten path. We didn’t realize how important signage was. As soon as we put up a few signs to direct people, the business started growing,” said John. 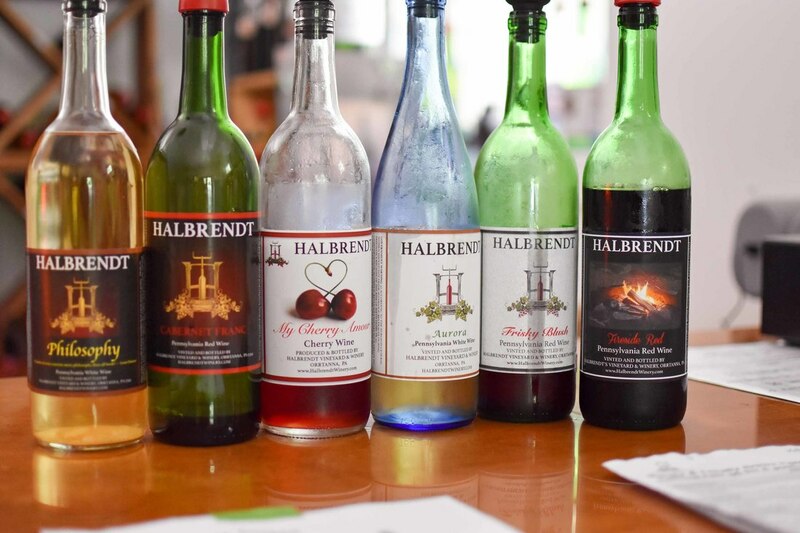 Halbrendt Vineyard and Winery is just one of the many wineries in the heart of the Adams County countryside that brings in visitors from all over to sample the local flavor. A Halbrendt Winery tasting room opened along Baltimore Street in downtown Gettysburg to bring the experience closer to the visitors. On his winemaking philosophy, John says, “We can afford to wait. This is not really my livelihood. It’s a nice activity that we enjoy, but it’s not like if I can’t sell wine I can’t pay my takes. We are not in any hurry to get product out the door, so we do not need to put in more chemicals to speed up the aging.” Because of this, Halbrendt Vineyard and Winery’s homegrown, local wine has a very fresh and natural taste to it. Even the added fruit is mostly grown on site. If it’s not grown on the property, the fruit is bought locally. 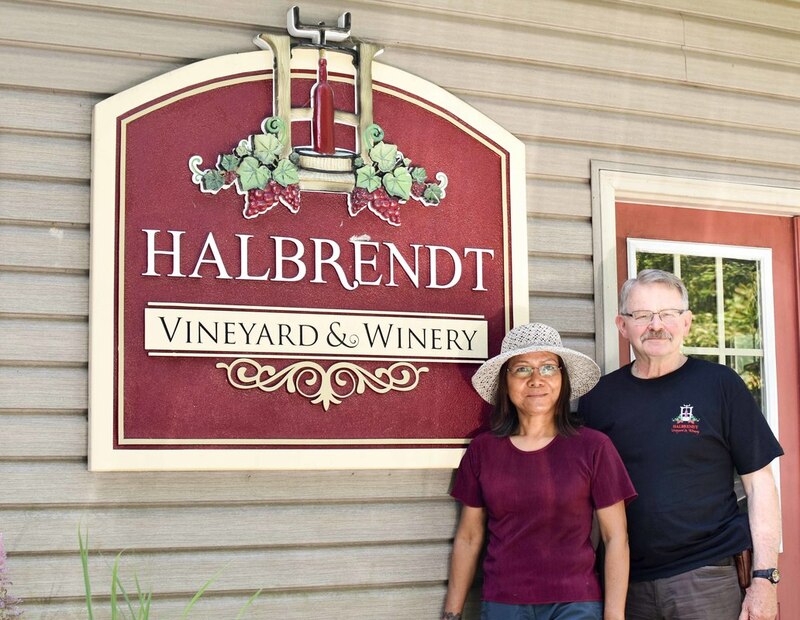 Being such a small operation, Halbrendt Vineyard and Winery is run by only John and Noemi. When it comes time to harvest the grapes they have friends and volunteers that will help, but day-to-day activity is handled just by the two of them. Because of their size, John and Noemi have the opportunity to really get to know their visitors and have genuine conversations. Noemi says that her favorite part about owning a winery is the education aspect of it.